Transforming our food system to ensure healthy, sustainably grown food for all. 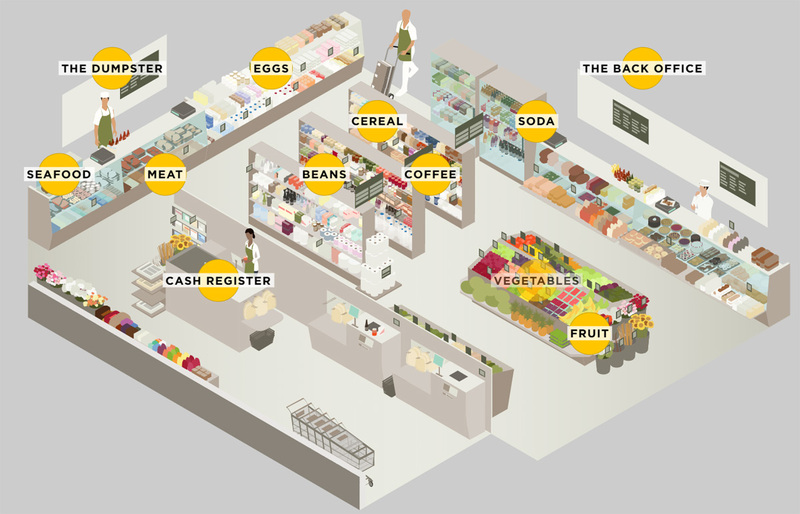 Take a trip through the aisles of a typical supermarket...and see how the apparent abundance of food choices masks a food system in dire need of transformation. Our food system is failing us—but science can help transform it. The U.S. government spends billions of dollars each year to subsidize crops used to produce processed foods and sugary drinks—the same foods the USDA’s nutritional guidelines tell us to eat less of. This policy failure is contributing to a massive and costly public health crisis, as rates of chronic, diet-related diseases like diabetes, hypertension, and heart disease have shot up—even, increasingly, among children. And the same policies that encourage unhealthy food production also support an outdated, unsustainable system of industrial agriculture, which has damaging impacts on soil, air, water, human health, and rural economies. Smart, science-based food and farm policies can increase every American’s access to fresh fruits and vegetables, saving thousands of lives and billions of health care dollars in the process. And by encouraging farmers to grow a diverse mix of foods using modern, sustainable methods, healthy food policies will also help keep U.S. agriculture productive for the long term. With powerful interests defending current policies, transforming our food system in a healthier direction will not be easy. But we can do it—and our future depends on it. Agriculture in the United States has taken the wrong road, and it isn't working. The wealthiest nation in the world is feeding its people an unhealthy diet—and growing most of this food using unsustainable methods. The results? A population threatened by a crisis of diet-related chronic illness; millions of acres of damaged farmland; chemical runoff spilling into our waterways. Our food system, for all its vaunted productivity, is failing us. U.S. food policy should work to ensure a plentiful supply of healthy food for the nation. But the current system of agricultural subsidies mostly benefits large-scale growers of commodity crops such as corn and soybeans. Our diet is dominated by processed foods made from these subsidized crops, and a growing body of research connects this diet to increases in obesity and the diseases that go with it. The solution? We need to eat more fruits and vegetables—and therefore, we need policies that encourage farmers to grow them. But Big Ag benefits from the status quo and is fighting to protect it. The late 20th century saw a major transformation in U.S. agriculture. Farms grew to enormous sizes, becoming focused on a few commodity crops and increasingly dependent on synthetic fertilizers and pesticides. And meat production became dominated by large CAFOs (confined animal feeding operations). These methods of producing food leave a host of problems in their wake. Runoff from chemical inputs and CAFO waste pollutes our water and contributes to global warming; monoculture—planting a single crop over a large area year after year—depletes soil and reduces biodiversity; overuse of antibiotics in meat production threatens our ability to fight human disease. The good news is that we know how to fix our food system. Science-based sustainable farming methods can (and do) produce abundant food without the pitfalls of industrial agriculture. Local and regional food systems can help make fresh, healthy food available to everyone. And forward-looking policies can help these innovative practices grow and prosper. We know Americans need to eat healthier food—and that starts with producing more of it. But growing healthy food using sustainable methods is only half the equation. We also need to make sure that this food is available and affordable—especially in lower-income communities, which are disproportionately affected by the health impacts of the industrial food system. Local and regional food systems, school food programs, food equity initiatives, and other innovative approaches can help ensure that all Americans have access to the fruits of farmers' labor. The farmers of the future will use sustainable practices that get the most out of the land while preserving and improving the health of soil, water, and local ecosystems. And the future, increasingly, is now. Growing numbers of American farmers are using sustainable practices to grow healthy foods—and thriving businesses. But in a food system geared to serve the needs of industrial agriculture, these farmers often face an uphill battle. Farm policy has become part of the problem—subsidizing the wrong foods, steering research dollars toward industrial agriculture, and creating roadblocks for farmers who grow fruits and vegetables or use sustainable practices. But it doesn't have to be that way. Policy solutions that will help farmers feed a healthy America are on the table, and UCS is helping to win them the support they need to become reality. Support local farmers, find out how cities are transforming the food system, and learn how to build healthy, "spongy" soil in your garden. Help prioritize healthy food and farms.